I almost never, ever click on the ads that appear on MySpace. Mainly because they fall into one of three categories. 1. The Activity Ads - These are flash-based ads that make you accomplish some sort of ridiculous task (often against some computer opponent) in order to win a prize. Examples include "Eat the hot dogs to win a ringtone," and "Swat the flies to win an iPod!" Of course, the wide selection of activities is tempered somewhat by the fact that it all involves clicking a button again and again as fast as you can. "hi. wanna chat sometime" "hello?" "are you there? lol." "come on, you can ask me anything ..."
Complementing this witty banter is a clip of some chick typing, laughing, waving, and adjusting her blouse, all set on a continuous loop, ala Speed. Personally, I think it may have been more realistic if the video actually synced with the instant messages, seeing as half the messages were sent while she was adjusting her blouse, not even looking at the keyboard. But I digress. 3. The Cell Phone Magician - These are lovely ads that say "Find out your horoscope!" and "LEARN WHO HAS A CRUSH ON YOU!" "Good Lord!" you say, "I may finally learn if Sandra fancies me as I her." So, you click on it. You're sent to a website that has a cartoon crystal ball or something. You have to enter in your gender, then your age, then your...phone number? Ah, you see, because they'll text you with your crush's name. "Well, that seems painless," you say. Sure does, until you read the fine print and see that you're paying $6.99 or $9.99 for these tidbits. And Lord help you if you use AT&T. Those bastards will tear a full $19.99 off your wallet's corpse each month on these plans. The kicker is, I'm pretty sure that they just send out the same thing to everyone who applies: "Your crush's name is: Doris." Now, to be fair, there's more than just those three types. But you'd be amazed exactly how much of MySpace they fund. And even when there is a (relatively) normal ad on MySpace, I still usually don't care. hence, I generally click on about 0.02% of the ads I see there. But sometimes - just sometimes - there is something that catches my attention for some reason. Like the other day, I saw an ad for something called Fathead. Remember those life-size cardboard stand-up figures? Well, these are like them, except they're some sort of sticker-like object, you stick them on your wall, and they're ridiculously expensive for what you get. 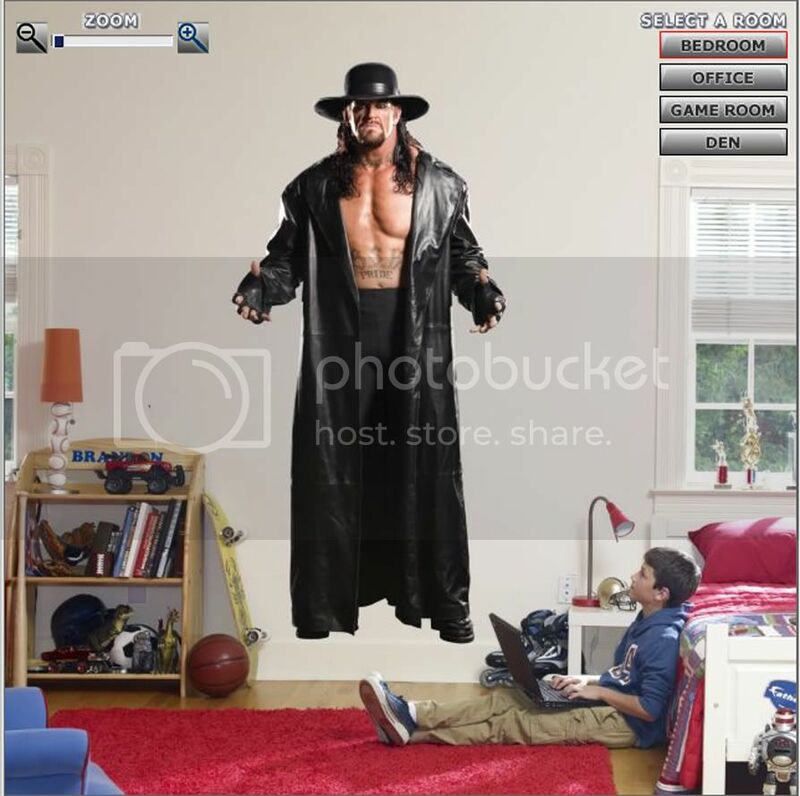 Well, this ad that I saw had a picture of the WWE star the Undertaker. Now, I'll make a small confession. When I was in my early teens, I was a fan of the WWF (back when it was still called the WWF) and the 'Taker was one of my favorites (which actually goes back to an old WWF arcade game from the early 90s). So, I decided to click on this picture to see what it was about. And that's when it showed this as an example of what you can do with their products: Parents, quick note: if this is in your child's room, you are a bad parent! I mean, good gravy. It's bad enough that this 11-year-old's room has this life-size image of a guy with a trench coat and an angry face. But the fact that it looks like he's levitating is really what would give me nightmares if I were in that kid's shoes. Extra covers over my head, thank you. Now, to be fair, that background picture is a stock one they use for all their different designs, so you could just as easily have Tiki Barber on there 9whoever the hell that's supposed to be). However, I'm torn between whether I find the kid's bedroom to be the most ridiculous, or this one right here. Ah, yes, nothing adds a touch of casual professionalism like a tattooed monster on your office wall. Imagine what being interviewed by this guy must be like. So, anyway, if I've taught you nothing else (and I think that may be the case), it's to not bother clicking on MySpace ads. Not only is it taxing on your computer (what with spyware and the like), but it's taxing on your eternal soul. I don't know if you watch enough television to see the fathead ads I have, but those ads feature explosions, strange dancing people, grizzly bears, and the statement that fatheads are a statement too powerful to describe. Whether that is true or not is up to you, but I'd check youtube for the ads. For the record, I liked taker too as a Wii (you see what I did there?) lad, and I would have loved to have him on my wall, to scare the living $%!& out of me every morning.